This year, the annual KNCB gala took place in the beautiful reception hall of the former Leidschendam townhall. Leidschendam-Voorburg was awarded the prize for the best cricket municipality in 2015. Alderman Nadine Stemerdink then offered to host this year’s gala. The gala drew a fair crowd with plenty of local heroes as VCC was nominated for a number a categories. Willem Ligtenstein received the prize for ‘best cricket accommodation’ on behalf of the board and ground staff. A just reward for many years of hard work. The ICC too recognised the quality of the ground and wicket in their match report on Netherlands-Afghanistan. 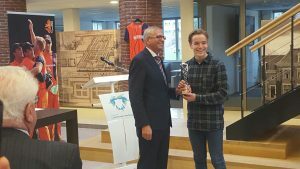 Bas de Leede was awarded the prize for best player in the Eerste Klasse because of his al-round performance for our first team and his results with bat and ball in the Dutch Lions. 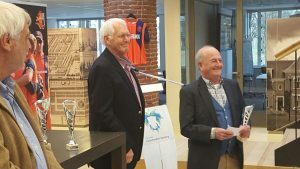 His niece Babette went home with even more cups: not only the best player in the category ‘Ladies’ but also as proud receiver of the Anne Weidema cup, the prize for the best youth player under 19. The U16 and Steffen Mulder unfortunately saw others wnning the prize for best youth team and coach. Special mention needs the addition of our coach Nolan Clarke in the ‘gallery of KNCB heroes’. Well over 10,000 runs in the Top/Hoofdklasse, almost 3,400 for the Dutch XI @ 38,40: enough to earn him a place on the list of Dutch Cricket Greats (which has Tim de Leede on it since 2008). VCC policy lines blended well together at the gala. A great ground, qualified coaches and an emphasis on our own youth. A fourth line, social cricket, was also acknowledged as we took home the diploma for the Zami’s second consecutive championship.